In the latest ANZ Australia Market Focus they report that lower commodity export prices and the upcoming Government budget update have prompted downward revision to ANZ economic forecasts. 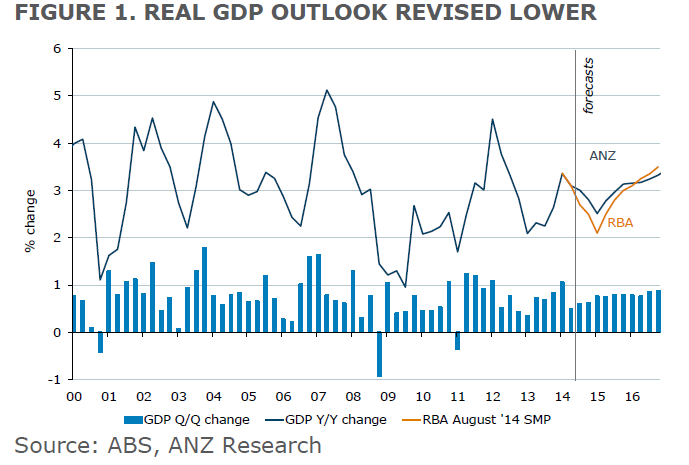 Lower commodity prices prompts downward revision to our Australian economic forecasts. The Government’s budget update, coming up this month, will show deterioration for similar reasons. The first RBA rate hike is now expected in November 2015. We have reduced our forecasts of the levels of fixed rates. Investor demand for longer-dated assets continues to influence markets. Yields will be capped in the medium-term, providing good levels to consider locking in funding. The USD uptrend is looking vulnerable. 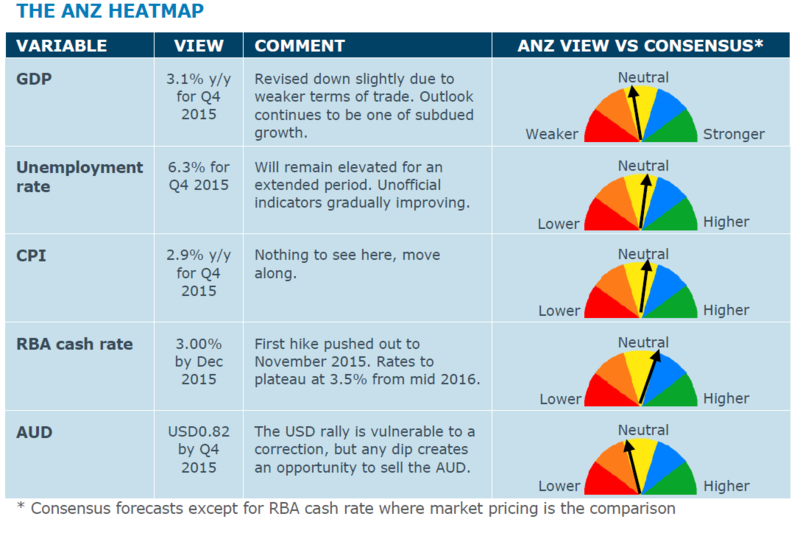 The AUD has been negatively affected by weak commodity prices and expensive valuation metrics. A more definitive breakdown in the USD uptrend would likely support the AUD in the very short-term. The floor for oil prices remains uncertain as OPEC decides not to cut output. Rising demand concerns from export markets keep Chinese iron ore and steel traders cautious. India’s gold import removal and Swiss Gold Referendum in focus for gold. The recent fall in Australia’s commodity export prices has forced a downward revision to ANZ economic forecasts. We expect lower iron ore, coal and energy prices will reduce growth in Australia’s national income by approximately 1ppt in 2015. This will firstly affect profits, wages and government revenues, and reduce real economic growth. We have lowered our real GDP forecasts by 0.3ppts over 2015 and 2016. 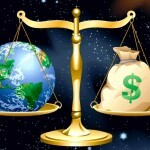 It will also delay the return to trend growth of around 3-3¼% by another six months. We now expect a return to trend growth in the second half of 2016. If, as we expect, commodity prices stabilise near current levels over the next year then these revisions represent a delay in the return to trend growth rather than a change in the trajectory of the Australian economy. We are still of the view that non-mining economic activity will take up the slack from declining mining and energy investment. The non-mining recovery has commenced, albeit narrowly, with strength evident in residential and non-residential construction and a gradual improvement in business investment. Last week’s CAPEX numbers for Q3 provided further evidence of this gradual recovery. The intentions component suggests a 5% increase in non-mining capital expenditure in 2014-15, in year average terms. A weaker path for commodity prices, corporate profitability and wages is also weighing on Australia’s fiscal stance. When the 2014-15 Mid-year Economic and Fiscal Outlook (MYEFO) is released in mid–December there is likely to be a deterioration in the underlying cash balance over the forecast horizon. The underlying cash balance will be larger than the AUD29.8bn deficit forecast when the 2014-15 budget was published in May. Subsequent years are also likely to show the budget worsening. 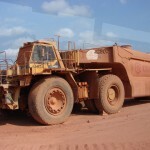 Lower-than-expected commodity prices, especially for iron ore, will directly result in lower-than-expected company taxes due to weakening mining profits. The iron ore price assumption in the budget looks to have been around USD100/tonne, metallurgical coal around USD125/tonne and thermal coal around USD75/tonne for 2014-15. These are well above current levels and averages for 2014-15 so far. Weaker wages growth and a softer labour market than projected in the budget will also contribute to lower-than-expected revenue and higher-than-expected expenditure. On the expenses side, there will be a greater-than-expected outlay on national security, which the Prime Minister said would be around AUD630m. There are a number of savings measures from the 2014-15 budget and previous budgets still facing Senate opposition, and so will likely only go through with some modification, if at all. These too, if they are modified or cancelled, will lead to a deterioration in the budget forecasts, although we are unlikely to see revised budget estimates on these in the MYEFO. Measures still being opposed include changes to university fee deregulation, the AUD7 co-payment for Medicare services and less generous family tax benefits. Although there have been some media reports this week suggesting that the AUD7 co-payment would go, the official line from the Treasurer’s office is that it remains government policy. The Commonwealth’s Medibank Private sale, which raised AUD5.7bn compared to expectations of between AUD4.3bn and AUD5.5bn, will provide funds to the Asset Recycling Fund. These will be used for funding and financial incentives to the States for new infrastructure. There will be no direct substantial revenue benefit to the budget. The deterioration in the fiscal position could slow down economic growth if the Government choses to offset it with policy changes. The Treasurer has suggested no further cuts to meet the downward revisions. That implies new debt issuance. However press reports have differed recently and some suggest the Government will consider further savings measures in MYEFO. We expect there will be some savings, but not enough to entirely offset the downward revisions to revenue and upward revisions to expenditure. The Government will not want to add fresh downward pressure on the economy. With global inflation low and domestic wages pressures absent, this weaker growth outlook will provide the RBA with more scope to keep monetary policy accommodative. As such, we have pushed back the timing of RBA interest rate increases by six months. We expect the first steps to take Australian interest rates back to ‘neutral’ levels in November and December 2015 with a 25bp rate hike in each month. As the recovery gains further traction in 2016, another 50bp of rate increases in the middle of that year will see the cash rate lift to 3.5%, our estimate of the neutral rate.